Plan your romantic getaway to Glenlaurel Inn in the Hocking Hills region in Ohio! 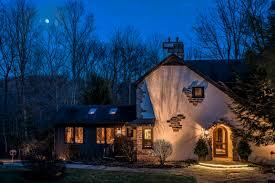 You are here: Home / Entertainment / Plan your romantic getaway to Glenlaurel Inn in the Hocking Hills region in Ohio! We needed an escape. A REAL escape that wasn’t too far away. What an incredible find! Glenlaurel Inn in Hocking Hills, Ohio…..less than a 2-hour drive from Cincinnati. What a warm welcome upon our arrival. Cookies, beverages, meeting the innkeeper and some of the staff, then a quick tour. Secluded, luxurious and romantic rooms, suites, crofts & cottages… The inn has 21 private, adult-only accommodations, with grand amenities, gourmet meals and exceptional service, with an emphasis on escaping the everyday grind. Cell phones are discouraged, no smoking, and no cable tv….they do have a great selection of movies and books though that you may use at your leisure! All accommodations have large tvs with dvd players! We stayed in The MacKay Cottage and our dear friends were in The Wallace Cottage. Each decorated in a Scottish theme….Living Room and Bedroom with fireplaces, kitchen, large bathroom, and hot tub on the private deck. Heaven! So secluded in the wooded setting….it was perfect. We were fortunate to be guests of the beer-pairing dinner, which began at Happy hour in the Loch Ness Pub. Dinner was then served in the Edinburgh Dining Room….It was fabulous! Six courses with beer as a pairing and in the recipes. Back to relax in the Cottages and hot tub time, which was perfect on a star-filled night. It’s amazing how different the sky and stars are when you get away from the lights of the city! Breakfast was served in the Main Building of the Inn…..a lavish, homemade spread with daily features, homemade jams and biscuits, and included with your stay. So yummy. We decided it was hiking time to work off a bit of the food…beautiful grounds right on the 140-acres with hiking trails, waterfalls and their own private, scenic gorge. Perfect. We took a drive after to see around the area set in Amish Country. We visited an Amish farmer’s auction, a glass blowing facility, had a picnic with the amazing lunch basket sent with us from Glenlaurel. So much fun…hard to believe this is all less than 2 hours away! Dining at Glenlaurel is an experience to remember. Glenlaurel’s gourmet dining is legendary for its Sottish flair, quality ingredients, and first-class service. Menus in the fine dining restaurant are prepared daily with seasonal ingredients that build on the foundation of a nightly featured entrée with a six-course prix fixe menu served Sunday to Friday and seven-courses on Saturday. The enchanting evening consists of six and seven courses by candlelight, bagpipe music, poetry, and a post-dinner visit to the dining room by the chef. Overall, it’s a gentle blend of dinner and theatre that leaves ample room for intimate conversation, and the Chef is fabulous at Glenlaurel! I’m telling you, the hot tubs in the cottages are genius! So relaxing…and the lack of cell phones really was incredible. We all need a break from technology every now and then. It’s very freeing. Trust me! Our last morning at the wonderful inn with another yummy breakfast. It was time to head back though, and the inn sent us off with another fabulous picnic basket to go, homemade cookies and drinks.